As you may or may not have heard, there's a presidential election today. (It's flown under the radar, I know.) To commemorate the day America chooses its 45th POTUS, we look back and rank the 10 best athletes who've ever sat in the oval office. 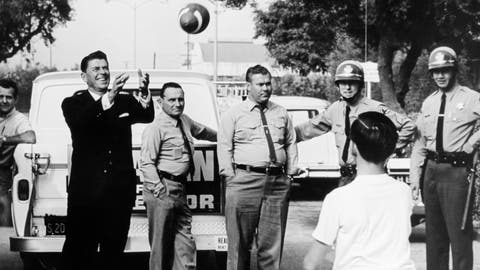 Nixon became a huge Washington Redskins fan during his time in office, often talking to coach George Allen after games and offering ideas for plays. One of those, according to legend, was a gimmicky reverse used in the 1971 playoffs that went for a 13-yard loss and led to a Redskins collapse. The play became infamous in Washington circles, with reporters at the Post and Times blaming the president for the play. Was it true? Did Nixon call that play or any others? Would Allen actually use a play drawn up by Nixon? Even Allen's daughter doesn't know. What is true is that Nixon, like so many other football fans, was furious about the league's Draconian blackout rules, which blacked out every home game in the local market, whether it was sold out or not. (Nixon would sometimes go to Camp David, which is outside the D.C. TV market, to watch the 'Skins play at a sold out RFK Stadium.) After Nixon lobbied Pete Rozelle to get the blackout rule lifted for the 1972 playoffs, Congress passed legislation that relaxed the restrictions in 1973, this time saying that only home games that weren't sold out would be blacked out locally. That was the standard up until last year when the NFL suspended the rule. 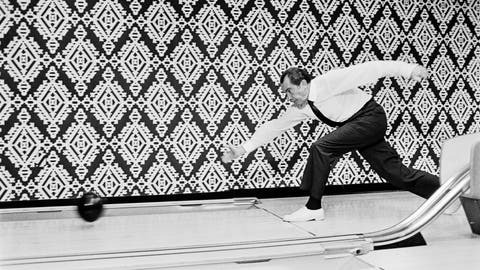 Nixon also installed bowling lanes at the White House. The Dude abides. 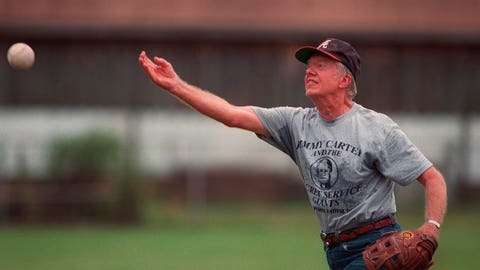 Though the former peanut farmer once told baseball commissioner Bowie Kuhn he liked playing sports far more than watching them, Carter became a staple at Atlanta sporting events (most notably the Braves) after his presidency. 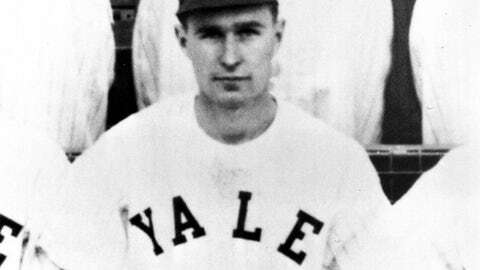 The 39th president ran cross country and played lightweight football (140 lbs.) as part of the sports requirement at the Naval Academy and was an avid softball player and tennis player throughout his life. The war on football is hardly new. It dates back to 1905 (older than that Cubs drought that ended last week) when 18 people died playing the game. On Oct. 15 of that year, The Washington Post wrote "nearly every death may be traced to 'unnecessary roughness.'" The president enjoyed the game and tried to save it, bringing the big coaches of the day to the White House for a safety summit. Instituting the forward pass was the big breakthrough. Helmets were still three decades away. As for his own self, Roosevelt was the president who most embodied the "man's man" mentality, though he's probably better described as an outdoorsman than an athlete. Just after his presidency ended, Roosevelt had an idea for a two-month safari that was paid for, in part, by the Smithsonian. On the trip, Roosevelt killed 296 animals including 17 lions, 15 zebras, 13 rhinos, nine giraffes, eight elephants, eight hippos, eight wart hogs, four crocodiles, four flamingos, three baboons, two ostriches, two vultures and, presumably, a partridge in a pear tree. 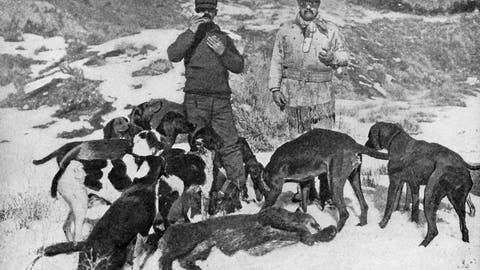 The president considered himself a conservationist however, responsibly seeking out game and ensuring that all of the animals he hunted had a healthy population. (No unicorns then.) He kept only 12 trophies, sending most of the kills to the famed natural history museums in Washington and New York. 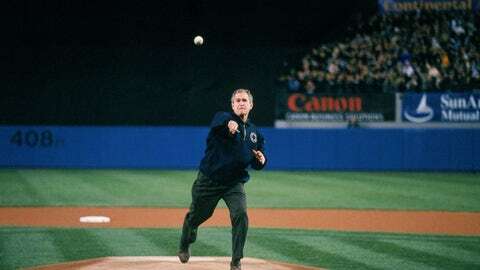 The greatest moment in presidential sports history happened a few weeks after 9/11, when George W. Bush strode to the pitcher's mound at Yankee Stadium and stood tall in front of 55,820 fans and tens of million watching on TV. It was a cathartic moment for a wounded nation - a grand act of patriotism and a subtle show of defiance that signaled America wouldn't be forever cowed by terrorists. There were enough goosebumps right there but then Bush, wearing a hidden bulletproof vest and knowing that the government has just issued a new terror warning, threw a perfect strike, from the rubber, no less. Bush, of course, had been a partial owner of the Texas Rangers before becoming president, buying the team in 1989 and selling it nine years later, making $14.9 million on a personal investment of $606,302. 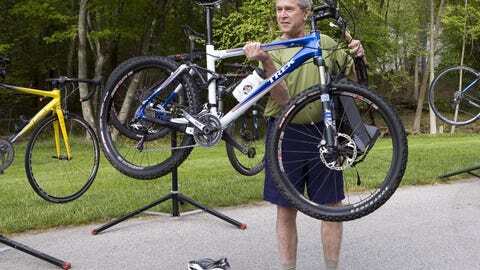 Bush also ran a marathon and was said to have ridden his bike so vigorously at his Texas ranch that Secret Service often had a tough time staying with him. In 1988, while hosting the hometown Super Bowl champs at the White House, Reagan, clutching a football, asked "where's [wide receiver] Ricky Sanders," and hit him with a perfect crossing route on the White House lawn. He was 77 at the time. And in make-believe athletics, Reagan portrayed George Gipp (The Gipper) in Knute Rockne All American. 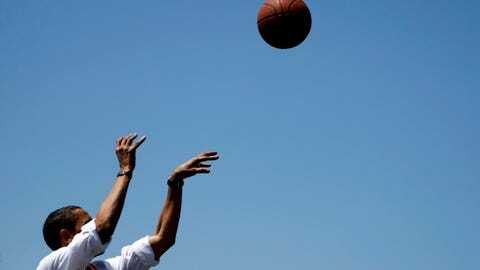 The president once said that he loved acting, politics and sports -- but wasn't sure in which order. A bad back slowed down JFK long before he took the Oval Office at the tender age of 43. 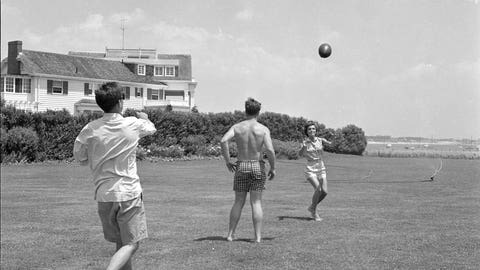 But he was perhaps the best presidential golfer (even with the bad back - there's some inspiration for you, Tiger), was a letterman at Harvard in swimming and repeatedly burned Teddy and Bobby on fly routes during the family's legendary touch football games in Hyannis Port. "I want an officer for a secret and dangerous mission. I want a West Point football player." That quote, perhaps apocryphal, was delivered during World War II by General George C. Marshall and has since become steeped in Army sports lore. Back in the days when the team was one of the best in the country, and even today when they're far from it, there's a special meaning and reverence of those who played ball at the United States Military Academy. A young Dwight Eisenhower did just that, serving as running back and linebacker for Army during his time on the Hudson. 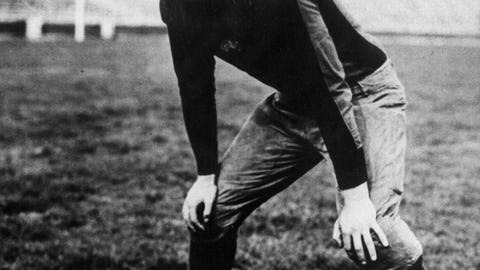 In the leadup to the famed 1912 Army-Carlisle game, the West Point players were obsessed with Carlisle star Jim Thorpe, the two-time Olympic track gold medalist from earlier that summer and, now that the season had turned, football star. The goal was to deliver a "hit so powerful it kidnapped Thorpe from consciousness," as Lars Anderson put it in his fantastic book on the game. Eisenhower got the lick and fazed Thorpe but only for a bit. He quickly scored and Eisenhower was later injured trying to make another tackle on one of the greatest athletes of the 20th century. He was forced to leave the sport and took up a number of others. 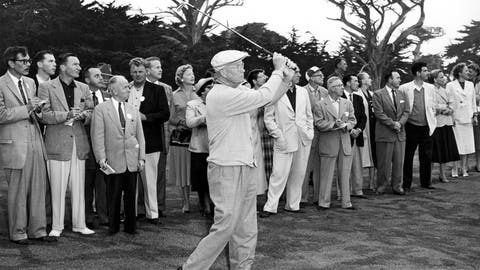 Eisenhower was also the most frequent presidential golfer (and perhaps the best depending on the day), playing more than 800 times and building a putting green on the White House lawn. He broke 80 at Augusta four times during his administration, though who knows how many more times he could have done it if not for that pesky tree on No. 17. This probably wouldn't be the first guess of most Americans, who today remember Ford's athletic grace from clips of Chevy Chase's bumbling, stumbling, fumbling Saturday Night Live impression. It's ironic though because Ford was, by far, the greatest athlete who ever took the oath of office. At Michigan, he played on two national championship football teams and was a team MVP in 1934. He was courted by pro teams including the Green Bay Packers. When football was done, Ford found new interests - swimming laps almost every day of his presidency in the White House pool he had built. He also played tennis, ran and, like most of his predecessors and successors, was fond of the golf course. Bob Hope jokes (to find Ford on a golf course you merely had to "follow the wounded) and clumsy reputation notwithstanding, Ford regularly shot in the 80s.